So… I’ve been doing a lot of kitchen experiments lately. Sometimes gluten-free, sometimes dairy-free, sometimes completely unhealthy…my favorite recipes, as of late, involve the immersion blender. These deceptively delicious cookies (see what I did there???) are no exception. These little buggers are good! But they’re sneaky. They seem like perfectly normal cookies at first bite…but… totally not. The secret ingredient? Garbanzo beans. I know, your mind is blown. Anyway, I’d seen variations of this recipe a couple of times but was hesitant to try it…The other night, I finally caved when I had a serious craving for melted chocolate goodness and–gasp!–no butter. In all honesty, I didn’t have to tweak this recipe very much…other than using maple syrup instead of honey and a little more peanut butter. Still good. 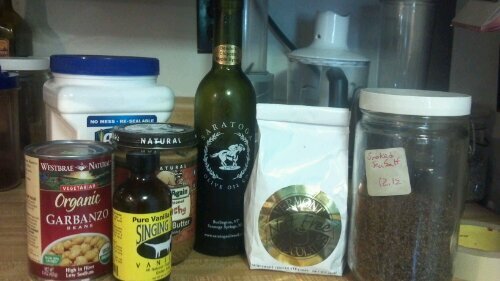 You need six ingredients….five if you don’t add salt (I used a no-salt peanut butter so I added smoked sea salt.). 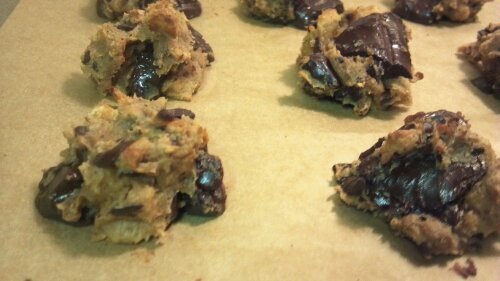 I brought the first batch (minus the few that I devoured right out of the oven) in for a gluten-free co-worker. I made another batch (minus the few that I devoured right out of the oven) for the hubby and his co-workers. I made the last batch for fun. The original recipe author says that these aren’t good cold…I disagree. But they are better warm. She also says to use a food processor and not a blender…an immersion blender worked perfectly fine, but ours is pretty powerful… I am kind of lazy when it comes to doing dishes…and I love immersion blending. So here you go. You’re welcome. Barely adapted from Texan Erin. 1 (15 oz.) can chickpeas, rinsed and drained. Pre-heat oven to 350. Line cookie sheet with wax paper and set aside. Combine first 5 ingredients in food processor or a large bowl (if using an immersion blender) and blend until smooth. If necessary, scrape the bowl to ensure you get all the tiny bits blended up. Bake for 8-10 minutes or until chocolate melts and cookies start to brown. It’s that time of month again-Foodie Penpal Reveal Day! This month, I sent a package to Emily from “Chicagoland.” I really enjoyed picking out her package because I got to use my imagination! 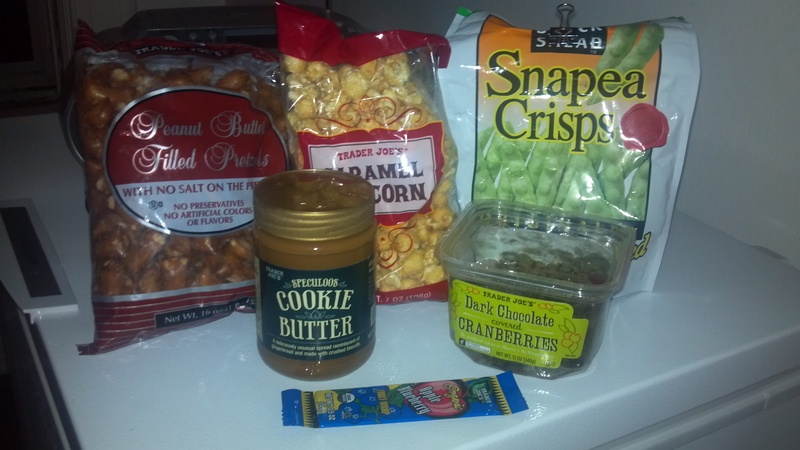 Collyn from Mass sent me a pretty awesome package full of Trader Joe’s goodies. Thank you so much, Collyn! I am loving all of it! First and foremost, cookie butter?! Where have you been all of my life? It is absolutely out of this world! It’s good enough that I’ve had to talk myself out of just eating it straight from the jar. I’ve also had to talk the hubs out of it. I am going to find a Trader Joe’s for the sole purpose of stocking up on this little gem. The Snapea Crisps disappeared in about two days… not my usual snack food, but I think I’ve been converted. The crunch is perfect. Dark chocolate cranberries. DOUBLE WIN! I’ve been savoring these. I also love that they are local to Mass. Kudos! Ben ate the fruit strip. Grrr…..
Obviously I loved the popcorn and pretzels… two weaknesses…what can I say. I’m also trying really hard to savor these…we’ll see how I do. Another huge thank you to Collyn! I can’t tell you how much I enjoyed this! If you’re interested in becoming a Foodie Penpal, here are some details. To sign up, visit this page! You must sign up by the 4th of the month. -Foodie Penplas is open to US & Canadian residents. Please note, Canadian Residents will be paired with other Canadians only. We’ve determined things might get too slow and backed up if we’re trying to send foods through customs across the border from US to Canada and vice versa. ***If you’re in Europe, please contact Carol Anne from This Is Rock Salt at rocksalt@thisisrocksalt.com to get involved! This week I felt the ill effects of over-indulgence. Last week, Ben and I pigged out. I’m talking cheeseburgers, french fries, beer, potatoes, kielbasa, barbecue, cheese and wine-lots of it. Monday morning I woke up feeling a hangover of sorts from all of the ridiculous things I had consumed in the days before. I exhibited all of the following symptoms: bloating, pimples, big hair, dry mouth, big sunglasses and headaches. I felt like I was 15 again. Not pretty. There was one thing I was craving: salad. Lots of glorious greens. I didn’t need it fancy, I just wanted vinegar and lettuce. Something to get my digestive system back on track. It’s now Friday and I’ve eaten salad every day this week. It feels good. Wednesday was my favorite: it was a salad of beet greens, red leaf and butter lettuce, scallions, parsley, beets and local goat cheese, topped with a mustard vinaigrette. My hubs is totally boss. But after all that green stuff, I needed something naughty. And I had an excuse; it was my turn to bring snack for my small group. So I made cookies. Delicious dirty cookies. I found some all natural dark chocolate peanut butter the other night and was dying to try it out. I’m so glad I did. These cookies are just right. They are chewy, light and full of air-They are gluten-free. They are full of big flavors without imposing on your belly in giant cookie form. Do it to it. You’ll be the biggest hit of the party. You’re jaw is going to hit the floor when you see the list of ingredients. Easy peasy. I’ll have to make these again to update with photos-I was in a hurry and didn’t think about snapping a quick picture… my apologies! 1-1/4 cup Peanut Butter (I used 1/2 cup creamy all- natural, 3/4 cup Dark Chocolate Peanut Butter)-if you are using regular peanut butter-use 1 cup, add some cocoa powder or some semi-sweet baking chocolate, melted with a splash of vanilla. 1 not-quite-cup brown sugar-the darker the better! 1 scant teaspoon smoked salt (you can find this at any specialty food store or co-op-Amazing find.) OR, use some regular sea salt. Preheat oven to 350. Line two cookie sheets with parchment paper and set aside. Combine peanut butter and sugar (if you’re using the cocoa/baking chocolate, add this in now as well). You can use your KitchenAid or mixer, but I just used a pastry blender. Add baking soda and egg. Mix until well blended. 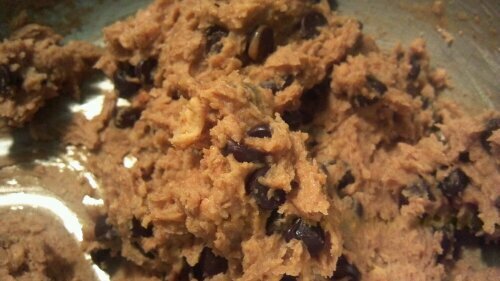 If you’re using chocolate chips and smoked salt, throw those in the bowl and mix until incorporated into the dough. Roll into walnut sized balls (they don’t have to be perfect, perfect is boring!) and transfer to baking sheet. Bake for 8-10 minutes until lightly browned and cookies feel firm. Makes about 30 cookies.